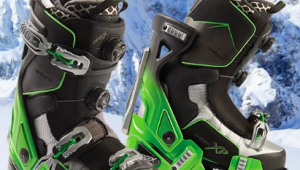 Other Things To Do In Winter (Part 3): Ride The Snow In Style. Snow Limo takes a non-skier not only up the mountain but also down a ski trail. 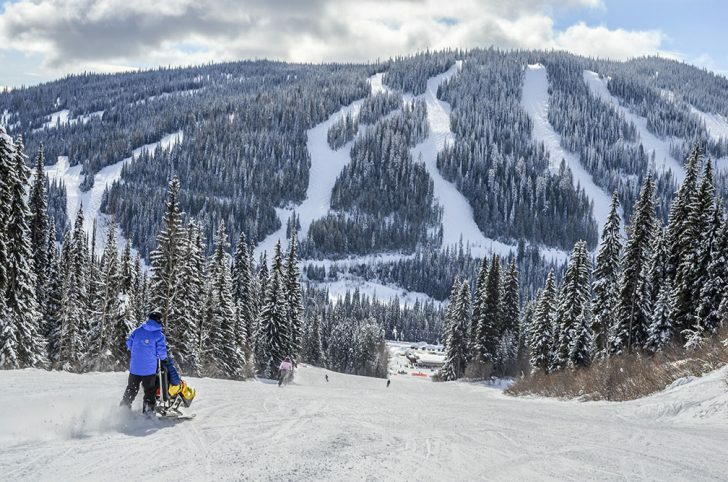 Credit: Sun Peaks Snow Limo Tours. There IS a way to experience skiing, even if you don’t ski. Or close to it, since you will be coming down an actual ski slope, keeping up with skiers. Only thing is you will be sitting down. The device that enables this experience is called a Snow Limo. It looks kind of like a dog sled basket, complete with guide behind. The guide, who is on skis, controls the sled’s speed and direction. You just sit there and enjoy the ride. It’s really popular with parents (think non-skiing moms) who want to watch their kids actually ski, not just skid to a stop at the village. 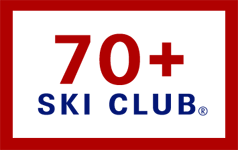 Various folks have estimated that perhaps as many as 15 percent of ski resort visitors don’t ski. Perhaps they never learned, they think they’re now too old, or have injuries that have prevented them from getting on-slope. 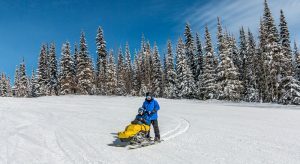 The original sled, then called “Sno-Limo,” was created more than a decade ago by Paul Auger, of Whistler, and his brother Guy. They wanted to get their 83-year-old mother onto the ski trails to see her grandkids ski. The two, with their father, Bill, designed basically a cross between a dog sled basket and an adaptive ski sled with a way to tether a skiing “chauffeur” behind to guide the sled. 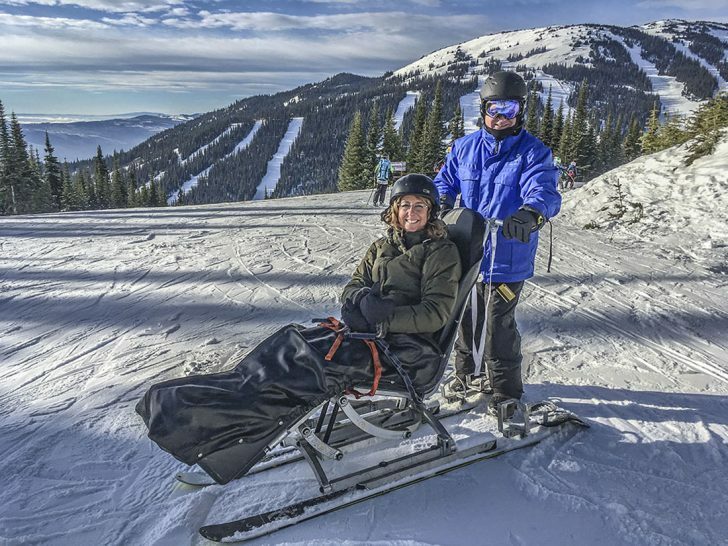 It took them four years of tinkering, but they eventually designed something that is easy to steer, easy to stop and easy to load onto a chair lift. Not unlike a dog sled, there is an emergency brake and the guides each carry a cell phone for emergencies. Thanks to a broken ankle, I wasn’t skiing this trip, so it seemed like the perfect time to try this out. I climbed in and company owner Mike Pfeil guided me to the lift. As the chair came around, he lifted the back end of the sled, and we slid onto the chair. At the other end, we simply glided down the ramp. And then we were off, wind in my face. It was exciting as we leaned into curves and sped alongside the skiers. It seems even faster than you expect since you are so close to the ground. My biggest problem was trying not to lean into turns. You are supposed to let the guide do all the leaning and steering. Mike has three flavors of ride: a gentle 30 minute ride down the green Five Mile run, more adventurous blue intermediate runs for an hour and a special two-hour package for the even more adventurous where the guide will take the passenger down more narrow runs. His guides don’t go on black expert runs, though. The ride is also a good way for a non-skier to do the mid-week resort fondue dinner at the Sunburst Bar & Eatery. You take the chair lift up at twilight and enjoy a three course fondue meal, complete with Swiss music. Then you ride down in the snow limo, equipped with lights for night. And if the night is clear, you’ve got starlight to accompany you. Just about any age can do this. Mike says the oldest person was a woman who was 97. The youngest he will take is five. For more on Snow Limo At Sun Peaks Resort, click here.